These three programs have nothing in common except that they’re all Mac-only; they’re a few years old, so they don’t get much attention; and they’re complex but not complicated. The whole world seems to use Microsoft Word, but you don’t have to. The current version of Nisus Writer, currently at version 5.1.3, costs less than $60. The tryout period is a generous 60 days. You can download Nisus 4.1.6 or Nisus Compact for free from the company’s web site. I’m not sure where “quirky” comes from, since the basic word processing commands are pretty much like everyone else’s. The interface is clean and simple, unlike Word, and I was able to start using it as my main word processor right out of the box. Nisus also loads reasonably quickly on my 75 MHz Power Mac 7200. Also, Nisus Writer just feels more “Mac-like,” even though Microsoft put a big push on to make Word 98 less Windows-like. I guess it’s the difference between a native and a resident alien. I haven’t needed to do any work on long documents in Nisus, but the company bills Nisus Writer as a “document processor.” It looks like it would play nicely with FrameMaker. MachTen is Unix that runs on Macs. There are versions for both 68k and PowerPC machines. Why MachTen instead of Linux, especially since Linux is free/cheap and MachTen costs $199? 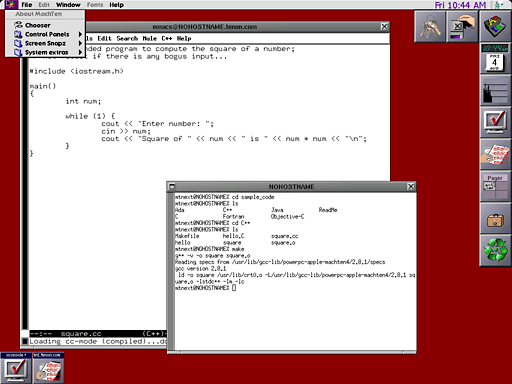 I’m not a Unix guru, but I can tell you why I prefer MachTen: It’s a Mac application. This means you don’t have to reformat your hard drive or add drives. On the down side, it means MachTen crashes if your Mac crashes. In my experience, MachTen itself is very stable. It has never crashed either any 68k or a PPC machine that I’ve used. If you want to set up a Mac for Unix and still be able to get to your Mac environment instantly, MachTen is a sound choice. MachTen is reasonably fast, even on slower Macs. To me, it feels faster than Linux. What you don’t get with MachTen is the latest desktop package, KDE or Gnome, although you might be able to compile it. The same is true for Netscape browsers and other tools Linux users expect. That’s not to say that MachTen is command line only; it includes a smooth, fast X implementation. However, the folks who wrote and maintain MachTen apparently believe they’re offering the best of both worlds: browsers and desktops and such on the Mac side, Unix tools on the MachTen side. Installation is easy, something few would say about Linux. Finally, as is the case with Nisus Writer, MachTen seems very Mac-like to me. Linux takes over your Mac; MachTen lives with it. I get tired of most games pretty quickly, but not Glider Pro. The premise is dirt simple: Fly a paper glider through the rooms of a house, collecting things on the way. Your glider gets a lift by going over air ducts. Of course, it’s harder than it looks. 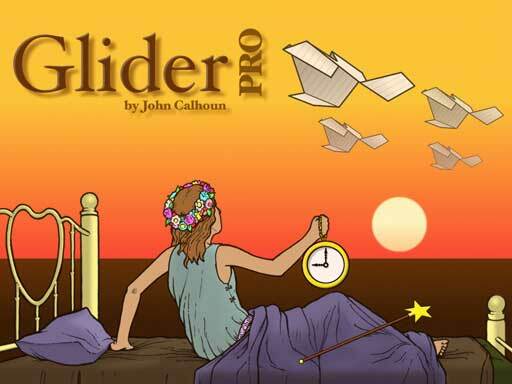 I like Glider Pro because it’s gentle; it’s the only game I’ve ever played where I felt more focused and more relaxed when I finished playing. And it includes an easy-to-use editor for building your own houses. Glider Pro is not graphically intense or nail-biting fast, which means older Macs can handle it just fine. However, it doesn’t feel “old,” at least to me, which just proves once again that game play – not graphics – is the true measure of a game’s quality.